Our Non-Stop Dual Unwinder (NSDU) is a high-speed PLC controlled, continuous feed unit designed to rollup to your production line and improve line efficiency. The NSDU features speeds up to 4,300 inches (110 m) per minute and will accommodate two 20″ (508 mm) label supply rolls with a maximum web width of 7.5″ (190 mm). As the primary label roll reaches a defined low level condition, a low label supply sensor alerts the operator by activating a strobe light and signals the drive motor to feed the rest of the labels into an accumulation bin. 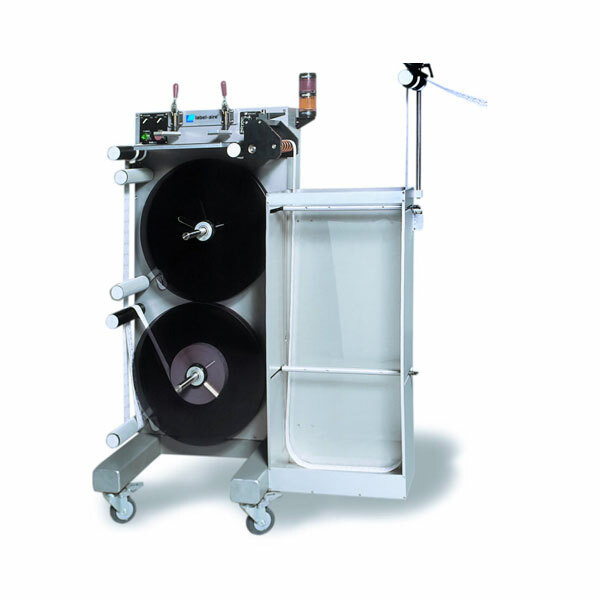 The twin clamps on the splicing table can then be used to quickly splice the secondary label roll to the primary roll while the labels in the bin continue to feed the label applicator. The NSDU comes standard with end of label and low label supply sensors/strobe.